FILE - People watch a news broadcast about a missile launch in Pyongyang, North Korea, July 29, 2017. North Korean leader Kim Jong Un says the second flight test of an intercontinental ballistic missile demonstrated his country can hit the U.S. mainland. The military is already exploring whether the United States can add another layer to defenses to those already in place for intercepting incoming missiles in flight, Keith Englander, the U.S. Missile Defense Agency's director for engineering, said at the Space and Missile Defense Symposium in Huntsville, Alabama, last week. The Missile Defense Agency's head, Lieutenant General Samuel Greaves, has said he wants to integrate the Aegis Combat System into the current ICBM defenses of the U.S. homeland. The Aegis system, mainly found on ships, could be fitted with the Standard Missile 3 Block IIA (SM-3 IIA) interceptors that are being developed in a joint venture between Raytheon Co and Japan's Mitsubishi Heavy Industries Ltd. 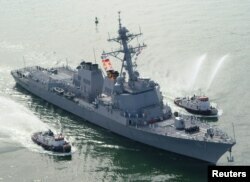 FILE - The USS Mason, which carries an array of advanced weaponry, including the Aegis anti-air warfare missile system, arrives at Port Canaveral, Florida, April 4, 2003. The Lockheed Martin-made Aegis system is currently deployed aboard 36 U.S. Navy ships, as well as at the Pacific Missile Range Facility on Hawaii. This is one of several avenues the Pentagon is studying to knock down inbound missiles. These include shooting the missile down soon after takeoff, stopping it in space as it flies above the Earth's atmosphere, and killing it soon after it re-enters the atmosphere before hitting its target. North Korea and the United States are struggling to agree on how to bring about the North's denuclearization, after Kim vowed to work toward that goal at a landmark summit in June in Singapore with Trump. In May 2017, the Missile Defense Agency held its first live-fire test of the Ground-Based Midcourse Defense against a simulated ICBM, and hailed the successful intercept as an "incredible accomplishment."